Thursday 13 January from 6pm to 8pm. 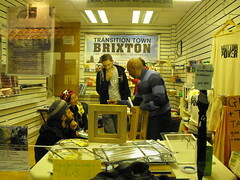 LIVE DEMOS at 6.30 and 7.30pm.Â TTB’s Community Draught Busters give you the opportunity to learn, hands-on, how to install draughtbusting material. Draught proofing is a cheap and easy DIY measure which will save you money, reduce your carbon footprint and improve the comfort of your home. If you are interested in attending this workshop please come to the community shop in Granville Arcade. Hi Sibylle, I’ve just filled in a similar box but I got no acknowledgement that the submission had been received. A) a Food Projects leaflet outlining the importance of food, i.e. i) Food Makes Communities, ii) Food Shapes the Economy, and iii) Food Drives all Learning. B) a working paper or ‘modern fairytale’: “Upbringing! New Family Structures” Upbringing comes before education. Family groups that should signpost a society in reasonable good shape are, in fact, a shadow of themselves in favour of a vengeful and brutish State. A modern, epic battle between unequals has ensued. I’m fully aware of issues. Am looking for long-term collaboration. The fairytale is a means to an end only. My sole purpose is to create, with others, the conditions for a joyful and compassionate world. Hi Mario, sorry for the delay in replying to your query. We have not had anyone available to check the comments for a while. I have passed your comment on to Sibylle.